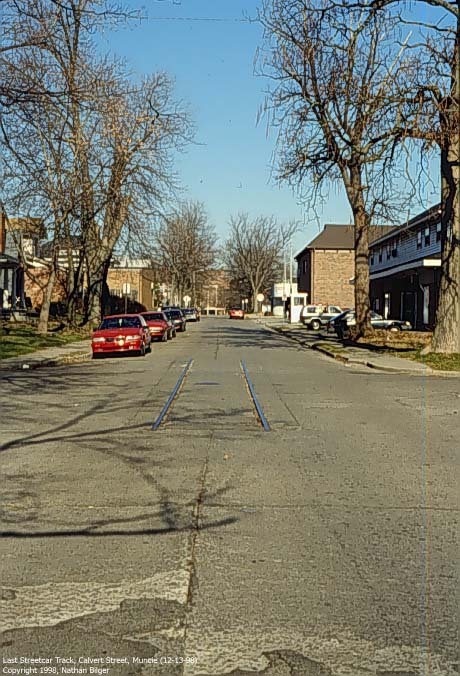 Anybody know if the old streetcar tracks in Calvert St just south of the Village are still there? Here's a photo of them that I took back in '98. I haven't been over there is awhile, but I am sure they are. Muncie doesn't like to spend money on that stuff. speaking of, the city finally removed the old PRR's Matthew Branch trackage from Macedonia just south of SR 32 and north of the NKP/NS tracks. This segment ran in the middle of the short section of street, with road on both sides. Don't know for sure, but I think they removed the rail and paved it over. I was over there visiting my niece a few months ago(she's a student at BSU), and they're still there. So is The Village Green (independent record store)! I don't spend *all* my money on model trains--I buy music too! Village Green... Can I say why? I've looked on Google Street view but can't seem to find the track section. If there are more details, we might have luck. It is/was in the middle of the Calvert Street/North Street intersection. The rails were still there when the Google Street View car went past. Is there anywhere I could find some history of the Muncie system? I'm an Australian interurban and streetcar fan, and am fascinated with the interurban and streetcar systems of the Midwest.